Looking north, "La Corniche", Mona Vale - Digital Order Number: a105575 - from album Scenes views and interiors of "La Corniche", Mona Vale, N.S.W., Sydney & Ashfield : Broadhurst Post Card Publishers, courtesy Mitchell Library - State Library of NSW. Viva Brock of The Oaks, Mona Vale, wrote a wonderful little song of place in 1906, a poem that reminded a few years prior to that what was originally called Bongin Bongin (lots of shells) in the songlines and place meanings for the original custodians, and what we now call quite simply 'The Basin, Mona Vale Beach' was known fleetingly as 'Mermaid Basin'. This prompted a whimsical wondering... was young Viva the mermaid upon that shore? 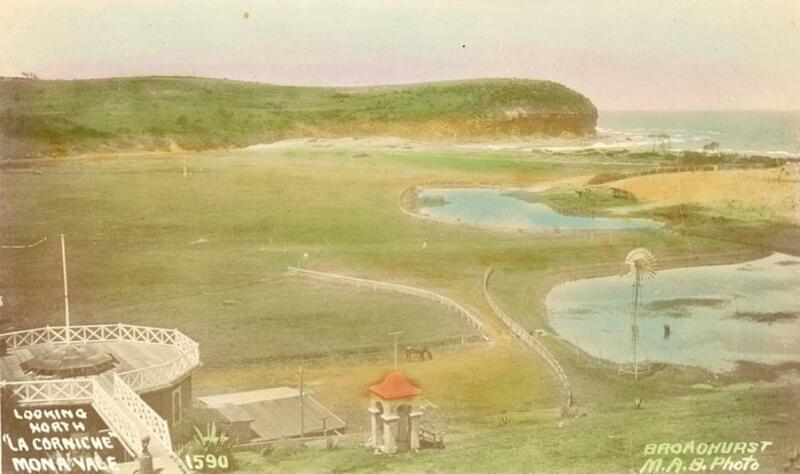 In a few old articles found a while ago reference is made to what we now call 'Mona Vale Basin', the lovely bay in the northern corner of Mona Vale Beach as 'Mermaid Basin'. 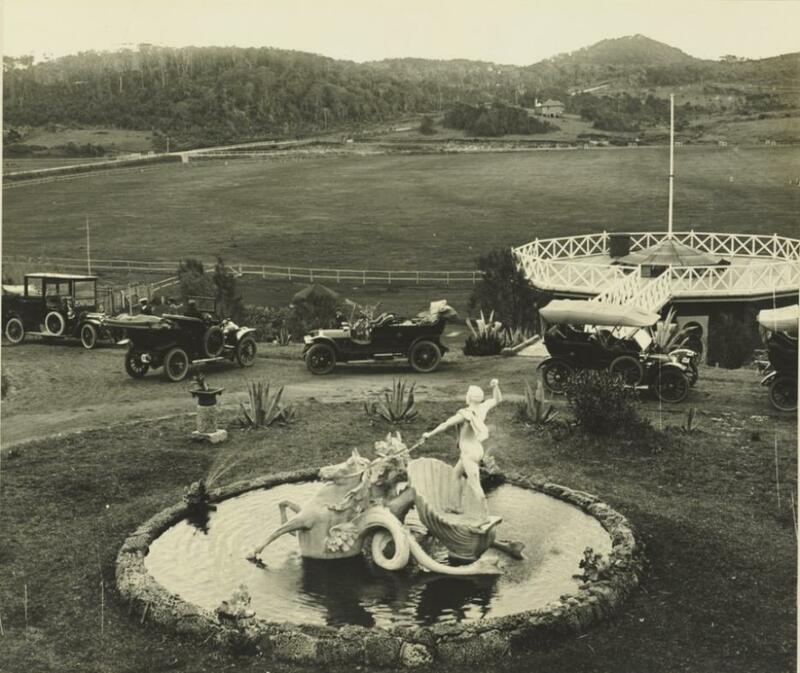 We know from other research that George Brock, the gentleman who built 'The Oaks', that he owned a yacht called the 'Dolphin', and had been a member of the Royal Prince Alfred Club from the 1890's, so certainly would have visited Pittwater prior to his grand dreaming realised in 'The Oaks'. you on to the lake country par excellence of Australia ? The placid reaches of Pitt Water are at the present time alive with all the delicate fish that swim in the southern waters, with fine, large, luscious prawns at the entrances of the lagoons. — For the last few weeks I have been trying the points between Manly and Barrenjoey for rock fishing, but without success, and we found fresh water as scarce as the fish. There seems to be none procurable at all as far as we could see. Any suggestion you can make will be acceptable, as to likely points. I might say that we ride bicycles, and so distance Is not of much account. From The Children’s Corner – then conducted by Ethel Turner, author of ‘Seven Little Australians’, ‘Three Little Maid’s etc. ): and soon to be a regular at Palm Beach herself! BY THE SEASIDE IN N.S.W. "The Oaks," Mona Vale, via Manly. Dear Dame Durden,-It seems quite a time since I wrote you. I was so pleased to see I was mentioned in the first and second honours of the last competition. The other day I sent in a story for Princess Spinaway's Competition. It is the first I have ever completed. Often I have written them, but never finished them. Nearly every morning a friend, my sister, and myself go for a swim before breakfast in the surf. It is glorious swimming in with the big strong waves, one after the other. When the swim is finished, we lie down on the sand and have a sun bath, which nearly burns us black. There are so many different and beautiful things on the beach. Some of the shells are a work of art, the colours on them are so prettily tinted, some shading from dark to light. My sister has a lovely collection of shells, mostly gathered off the beach near us. I think the sea egg is the quaintest of them all. To get a large one of these, you must hunt for it amongst the rocks where it lives in a round hole, as the shell Itself is round. It is covered with pointed spikes which enables the fish (who lives Inside the shell) to travel about. The largest sea egg I have seen just fitted Into my hand(which is not very small) and the smallest I have seen was about the size of the tip of my finger. The shell is very delicate, and is either grey or pink. There are so many different things to tell about shells and their wonders that I am afraid, dear Dame, it would take all the page to describe them; but as the sea-egg is a favourite of mine, I thought I would tell you all about it. I suppose you have seen an octopus. It is a very funny fish. However, I will tell you the kind we have here. The body Is flat and long, with great long legs and arms projecting from its body, and each leg and arm has suckers underneath them, which is like a tiny white shell, very soft and jellylike. The fish is harmless In the way of biting, but is dangerous when it is a very large one, as it dings to you and squeezes with great strength. When it is angry with you it throws black liquid all over you. I love to spend a whole day on the beach and Interest myself in its wonders. I hope you will understand my descriptions of the sea-egg and the octopus; they are poor; but I hope to improve each time I write to you. I will finish my letter now, and hope you and the rest of the Court are well.-I am your loving correspondent. They wept like anything to see a girl upon the sand. "If she were only swept away," they said, "it would be grand." Do you suppose," the Sea-egg said, "that still she'd want to stay?" "I fear so," said the Octopus and brushed a tear away. "I'd squeeze her up to jolly In the winking of an eye." "Still, why not throw your ink at her?" the Sea-egg did reply. But a revenge so horrible was never planned before." ' For don't you see," he added, "she's already fond of ink. With a consequence so awful that I shudder as I think." While odes unto the billows continually she'd do. An 'Ode Unto an Octopus,' or 'Lines to Egg of-Sea.' "
Won't you be trotting home again; it's high time you went in? 1. What is a salmon on a gravel path? Answer: A fish out of water. 2. Why are poultry the most profitable on a farm?-Answer: For every grain they give a peck. 3. If I buy four cakes for a penny, and giveaway one of them, why am I like a telescope? Answer: Because I make a far-thing present. When Viva moves to 'the city' in 1907, she expresses missing 'the freedom and beautiful air of the country' - Mona Vale! 'I knew it, the chimney is on fire!" Then there was a stir, and we hastened outside to find it was true, for there a great blaze and flying sparks wore shooting upward from the top of the chimney. Someone suggested wet bags to be thrown over it; others buckets of water, and so on. I was summoned to "awaken the maids. I banged and called loudly at their door, which was soon opened, and two frightened, ghastly figures appeared. "Hurry!" I said; "the chimney is on fire; Wrap yourselves in cloaks, and come and help!" Then the groom was called. Everyone was hurrying hither and thither with buckets of water when I returned. The groom and two others were on top of the roof in no time throwing water as fast as they could over the blaze. One girl, who was also a visitor, declared it could not be put out, and the house would be burnt to the ground. She rushed inside to her room, and was soon back with her silver purse and brush clasped preciously within her hands. She has always been teased ever since, as you may guess. At last the blaze grew smaller, and after a real good half an hour's work we were relieved to see the fire was out. We were tired of handing buckets of water up to the three men on the roof, and were fairly splashed during the hurry. When we returned to the drawing-room the fireplace and hearth were covered with water and lumps of soot floating on top of it. Then we all set to and helped straighten things up, which took some time. It was very late, and we talked and laughed a great deal over the exciting little adventure. We then went to bed somewhat dazed and it was not till the beginning of the new day that we drifted away into the land of nod. I hope,' dear Dame, you have enjoyed this description. You will see by the address I. am now living in Sydney at Rushcutter's Bay, and like it immensely, but miss the freedom and beautiful air of the country. By Viva Brock, 'Aloha', 'Rushcutters Bay' (aged 16 years). FROM: Album 57: Photographs of the Allen family, 2 May 1911 - 7 October 1911 Digital Order No. a3289055; 'Top: Enlargement of view taken looking over the Polo Grounds. The road up the hill leads to Barrenjoey' and Digital Order No. a3289054; 'Below Enlargement of view taken from Brock's house, 3rd of September, 1911'. Both Courtesy State Library of NSW.